... if you had a pretty decent vz-24 action to build on? Basically I picked one up and I have no idea what I'm gonna build on it. I have everything I need (2 338's, 300wsm, 45/70, 22-250, and a 30-06). I have a 1917 action that I'm probably gonna build either a 375, 416 or a 458 on. I'll probably just end up building a whelen but what would you do? .25-06 AI with 27" bbl. What to build on VZ action? I understand your problem. What to build when we already have all the varied calibers we need? I also acquired a good VZ Mauser. Actually I had four good military Mauser actions, but sold them all except the VZ because I wanted something special on it. I decided to build something classic because I don't have any rifles with wood stock. My choice is the 9.3x57 Mauser. I know it's odd, but Pac Nor has the reamer, and I bought a lot of the Norma brass. Dies were cheap from RCBS. If the 9.3x57 is too obscure for you, then go for the 9.3x62, which is a lot more popular. I already have a 9.3x62 on an FN action, so I just didn't want to make two in the same caliber, and the FN is darn near perfect. I really like the 9.3mm, so I believe you will be happy with it too. When the 9.3x57 is finished, I'll have four rifles in 9.3mm - 9.3x57, 9.3x62, 9.3x74R (Encore) and a wildcat 9.3 - 338 on a Ruger 77 MK II. I'd be tempted to build a light little 20" 358 Win or 22" 35 Whelen. But then I already have those. How about a light little 20" 7x57. Whoops. Got one of those too. If you don't have any of these, you don't know what you're missing. A small light rifle with pleny of oomph turns into a heck of a carry rifle, and will quickly turn into your favorite for general knocking around. My 358 is my favorite with ramp front sight, aperture rear and QD scope mounts. It's so handy without the scope that I'm not even sure which drawer the scope is knocking around in right now. Why not keep it an 8X57? Replace the barrel if you need to, trim it to 22" or so, lighten it up a bit, or install a new Douglas, load with good bullets around 200 grains in weight or so, and it'd be a dandy! I agree. The 8x57 is a heck of a round, and the bullet selection is a lot better than it was a few years back. I'd have no qualms about using one as a light carry rifle. a very nice Mexican Mauser, and a small ring K98. I figured to do the Mex up as an 18 or 20 barreled .358 Winchester, the K98 after I got to looking, had a very nice bore in it, and the profile is smaller than most sporters. I am in the process of putting that 8X57 together into a nice piece of walnut that originally was inlet for a 96 Swede, and it's going to make a very nice little rifle. Receiver sight? That's my pick for quick, and trouble-free in all weather. The 8x57 is a heck of a round, ... I'd have no qualms about using one as a light carry rifle. I am in the process of putting that 8X57 together into a nice piece of walnut ... and it's going to make a very nice little rifle. You guys warm my heart. That mauser step, on the barrel draw files very nicely into an octogon!! I saw a home made custom once in 7mm where the owner turned it into a half octagon...... very very classy!!! I'm partial to the old Redfields, but any of them would be really nice, Darreld. Never thought of draw filing the step, but it makes perfect sense, Reuben. And what can I say to you 8x57, when we agree so strongly? I guess it's best to say that anyone who can't see what all the fuss is about simply hasn't shot the round enough. Well, a 7x57 would be tempting since you have the other niches pretty well filled. I like the receiver sight idea especially for work under 150-200 yds. For up to 300, then a scout or fixed pwr 4x or 6x. As for the 1917- 375. Thanks guys, I just got my laptop back. it gave me the blue screen of death again about a week and a half ago. I went with the 35whelen. I thought about the 8mm and 9mm but decided the 35's bullets would be easier to come by. 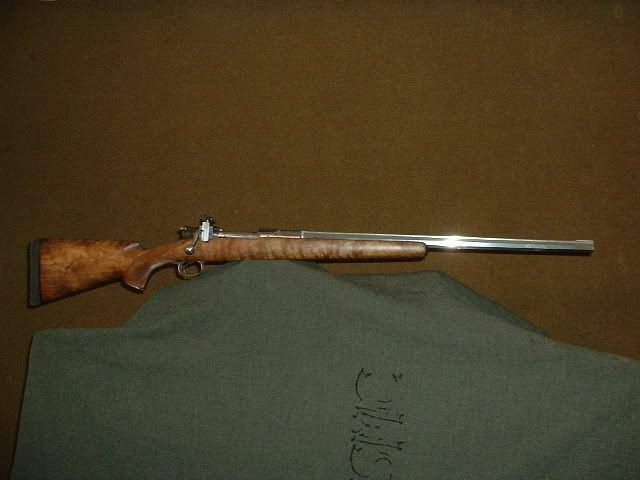 I went with a 22" shillen tube, bueller (sp) safety, timney trigger and a hinged bottom.. I picked up a cheap stock on auction arms to get me through until I can pick up a decent blank and have someone carve me a good stock. As for the 1917 action, I'm thinking of getting rid of it, but if I keep it, I am leaning towards the 375.